This case study involves an important trial and appeal in the Federal Court of Australia to restrain wheat farmers from contravening the Environment Protection and Biodiversity Conservation Act 1999 (Cth) (EPBC Act). The case is an example of responsive regulation, an enforcement model first proposed by Ayres and Braithwaite (1992), in which regulators signal to industry their commitment to escalate their enforcement response whenever lower levels of intervention fail. 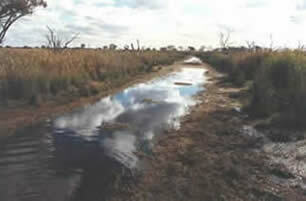 The Australian Government Department of the Environment and Heritage (DEH) became aware of clearing of the Windella Ramsar site in September 2002. 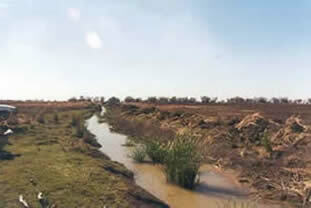 The site was part of the Gwydir Ramsar Wetland, listed under the Ramsar Convention in 1999. DEH inspected the site in late 2002 and found 20% of it cleared. Following the inspection DEH tried to negotiate rehabilitation of the site but did not initiate legal proceedings to prevent further clearing. A further inspection by DEH in July 2003 found that 100% of the site had been cleared, an area totalling 100 hectares. Legal proceedings were then commenced. In the first stage of this case, the Commonwealth Minister for the Environment & Heritage sought and was granted an urgent, interim injunction (on an ex parte basis) to restrain the farmers from continuing to contravene section 16 of the EPBC Act by preparing the site for the planting of a wheat crop. The farmers then applied to the Court for the interim injunction to be dissolved. Sackville J refused that application and the matter proceeded to trial. in the alternative, the clearing did not have a significant impact on the Ramsar wetland. Sackville J dismissed the arguments raised by the farmers and found that they had contravened section 16 of the EPBC Act. Sackville J granted an injunction restraining the farmer's activities and requiring them to rehabilitate the wetland. His Honour also awarded pecuniary penalties totalling $450,000 against a company director and the company responsible for the clearing, plus costs. The farmers appealed against these decisions but the Full Court of the Federal Court dismissed their appeal. Application filed by the Minister for the Environment & Heritage. Judgment of Sackville J dismissing motion to dissolve interim injunction: Minister for the Environment & Heritage (No 1)  FCA 857. Amended Application filed by the Minister for the Environment & Heritage. Further Amended Application filed by the Minister for the Environment & Heritage. Judgment of Sackville J granting application: Minister for the Environment & Heritage v Greentree (No 2)  FCA 741. Judgment of Sackville J ordering an injunction, a pecuniary penalty totalling $450,000, and costs: Minister for the Environment & Heritage v Greentree (No 3)  FCA 1317. Decision of Full Court dismissing the appeal: Greentree v Minister for the Environment & Heritage  FCAFC 128. Ayres I and Braithwaite J, "Responsive Regulation: Transcending the Deregulation Debate" (Oxford University Press, Oxford, 1992). Thanks to the Department of the Environment and Heritage (DEH) for providing the images used on this page. Thanks to the Environmental Defenders Office (NSW) for obtaining the court documents used on this page.